I haven't posted here in a while so here is a bit of a catch up and a run down of what I have been up to. Firstly uni has started again so Ive actually had work to do during the day so I can't just go out climbing all the time. Nights have started to get darker too which hasn't helped. The climbing I have done has mostly been bouldering. 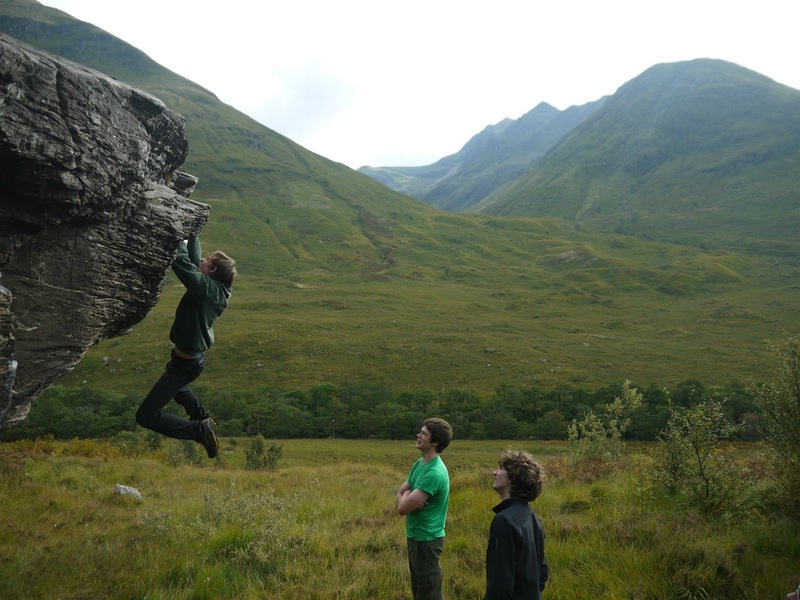 I have bouldered in Edinburgh, Glen Nevis, Northumberland and the Lake District in this time. 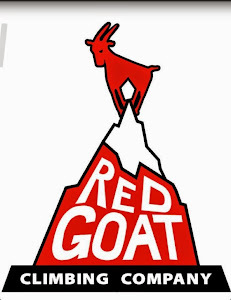 In Edinburgh I have visited Agassiz rock and the Crags, I haven't really managed anything new at the crags, although I am trying to work the R-L variation on the Black Wall. 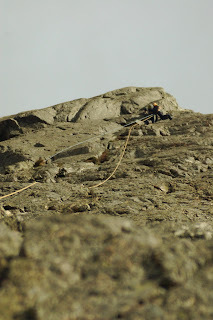 I managed the high traverse at Aggasiz Rock in my only trip there. 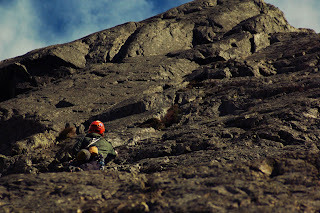 The high traverse uses high holds running L-R along the crag. It is quite pumpy and polished and I was pretty happy to get it done. 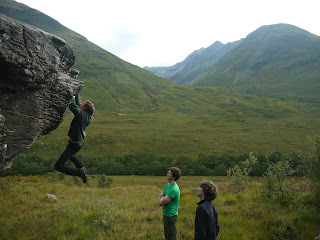 The EUMC Glen Coe trip saw me spend two days in Glen Nevis bouldering. Here I managed to tick a few easy problems and my first font 7b! It went down pretty easily, so Im not convinved it was 7b. The problem in question was The Right to Silence on the Cameron Stone. On the EUMC Lake District trip I spent saturday afternoon at Gimmer Crag. I climbed with Joanna and we didn't take a guide book with us so we just climbed something which looked good. The route we did was D Route, which gets Severe, although I think it is abit harder than that. On saturday evening I met up with Pete Holder and Pete Hill (Pete^2) and headed to the Works, a dry tooling crag near hodge close, more in this later in the post though. On Sunday Joanna, Liyen and I headed to the Langdale Boulders. These are a collection of boulders very close to the road near Chapel Stile. Here I climbed The pocket (V5), The overhang (V5) and a number of easier problems whos names I have forgotten. I also tried a traverse line which starts near the overhang and crosses under the pocket and finishes around the corner. I was very close to getting this, falling off the easy finishing juggy holds. It is supposed to go at about V6, which I think was about right. Liyen was trying this with me and she was also very close to completing it. I have made a few trips to Northumberland recently, visting Doveholes and Bowden. The trip to Bowden was with the EUMC. I spent the day bouldering and managed to climb His Emminence (E4/font7a+), as well as a few easier problems and worked lots of hard things. I have made two trips to Doveholes, one by myself and another with Fergus Cuthill, Tom Eadington, Liam Ingram and Sophia Borgeest. On my first trip everything felt very sandy but I managed to climb the sand bag traverse of Dont Look Down (font 6a) and sandy sand bag mantle shelf of Moorish Idol (font 6b). On my second trip I had a much more succesful trip. I managed to dispatch Sloper City (font 6c), Funfatatus Ejaculatus (font 6c) and First Contact (font 7b) without too much difficulty. 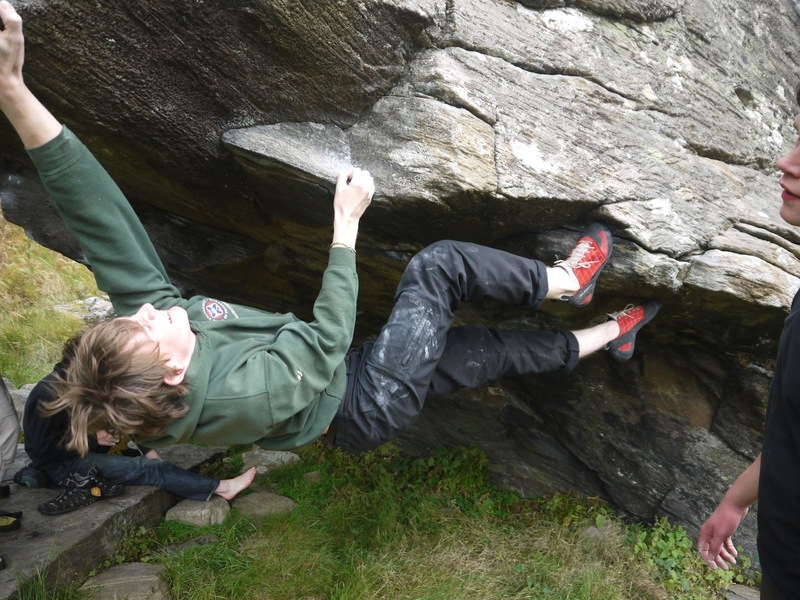 I also managed to flash Nellie (font 6c) and the Sit Start to Stone of Destiny (font 6b). This was undoubtbly my most succesful day to date in Northumberland. As well as plenty of bouldering my mind has been on the forthcoming Scottish Tooling Series. The first competition is on the 3rd November. 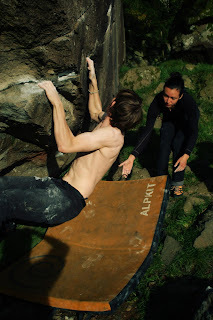 I have been trying to structure my training at the wall around drytooling with plenty of smooth movements and fig fours. As well as climbing indoors I have managed to get a trip out to The Works in the Lake District, as mentioned earlier. Here I climbed Steves Corner (M6), and fell off the very top as a torque popped! I also attempted Bloodline (M10). 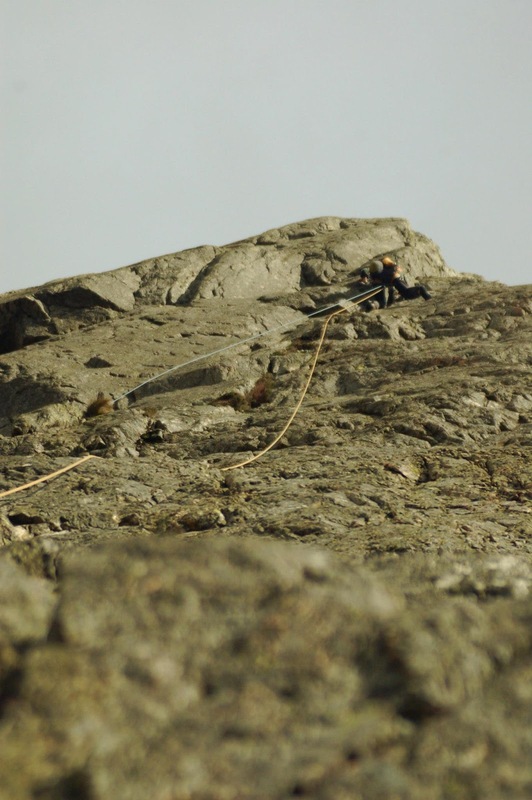 It didn't complete it partly as I was out of practice with drytooling outdoors, partly because I couldn't see very much (all though that is a pretty poor excuse) and probably because I didn't really try as hard as I coudl have done. This failure has given me a few things I feel I should work on for the STS atleast. I will hopefully be able to get a couple of trips out to Newtyle before things kick off, and maybe some new picks for my axes. I really hope to improve on my second place this year, and seeing as I appear to be climbing much better than I was this time last year, I think I can give it a good go.